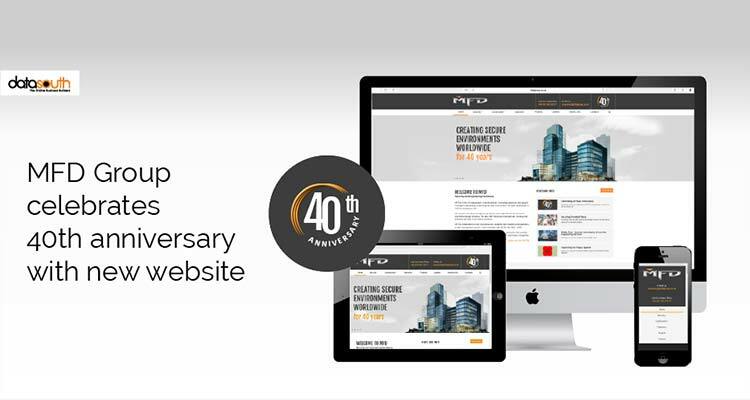 MFD Group celebrates 40th anniversary | Datasouth UK Ltd.
Datasouth has just completed an eight-week project to get the MFD Group live with a new website in time for their 40th anniversary. The MFD Group started in Romsey, Hampshire, in 1975. They provide specialist building construction and anti-terrorist security consultancy all over the world for some very high profile buildings and clients. The MFD Group has been a client since 2002, and ever since we built their first site, web technology has improved significantly. Modern sites need to be responsive to mobile devices and able to engage clients in ways that are significantly different to the technologies of 15 years ago. Clients need to be able to publish frequent updates and allow visitors to share content easily. Up-to-date content is more important than ever when it comes to search engine optimisation, and it was important that the MFD Group were able to add and update content quickly and easily on a regular basis. This is one of the reasons that we chose concrete5 as the CMS of choice. Previous versions of the MFD Group’s site had a bespoke (and somewhat clunky) content management system with limited editable regions. This often required them to revert to us when changing some areas of their site. Concrete5 gives them total control over everything from menus, pages, sections, images, templates, and content, using a simple intuitive user interface. All edits are applied directly to the page they’re viewing—and even complex content can be added without requiring any interaction with us. We would like to congratulate the MFD Group on their 40th anniversary and thank them for being a great client. They have been working closely with us to make the project run so smoothly from initial design concept through to going live just eight weeks later. The site was a pleasure to work on, and it’s no secret that we love working with concrete5. We’ve highlighted some of the reasons we love concrete5 so much in an article we’ve written. If you would like to find out how concrete5 and Datasouth can work for you, please give Cris or Rob a call on 023 8089 0800 or send us a message through here.